Historically, haymaking meant cutting forage with a scythe and stacking it in small stacks. The hay remained in stacks and animals ate from the edges. In some parts of the world this method of haymaking may still be used. However, although much about haymaking has changed with new technology, the main purpose of haymaking remains the same. The goal of haymaking is to produce a stable, high-quality animal feed with minimum expenditure. Hay has been used extensively to provide feed in beef, dairy, sheep, and horse livestock systems when grazing is not feasible. Grazing animals on pasture is more ideal than haymaking. Hay is not as nutritious as fresh forage grazed by animals. In addition, hay is harvested and stored which requires manual labor and machinery. But utilizing the surplus of forage pastures during peak growing times for use as feed during the winter is wise if the forage is harvested wisely and stored properly. Deciding when to make hay is a critical decision and should be based on an understanding of plant growth and harvesting should be done when there is a likelihood of several days of good haymaking weather. "Make hay while the sun shines" is a familiar phrase but there is more to consider in determining good haymaking weather than just sunshine. Understanding the following concepts will enable a hay maker to utilize the weather in the successful production of high-quality hay. The desirable conditions for haymaking include the following principles. Objective: Produce a stable animal feed of good nutritive value with a minimum loss of dry matters and with minimum expenditure. Timing: Harvest at first bloom or heading(anthesis) stage. Considerations: 1. Maintain leaves which contain the best nutrition. 2. Dry rapidly to 15-20% moisture. 3. Maintain green color which indicates minimal deterioration. Storage: Protect hay from deterioration. 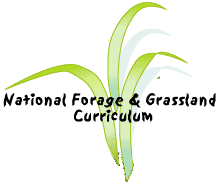 Select a forage species that can produce a good hay. Good hay retains as many leaves as possible since the leaves contain two/thirds of the protein. Species like meadow foxtail do not have enough leaves to make a good hay. Harvest the crop at the best stage for maximum nutritive value and yield. Forage crops produce more yield as they mature but nutritive value and palatability decrease af first bloom or heading (anthesis stage), so good hay must be harvested to balance the best quantity with quality. Cut (swath) the hay so that drying and baling the hay can be done efficiently while maintaining the quality. Swathers usually cut and lay the forage in windrows (perferably wide and loose) to facilitate baling. Swathing so that a long stubble remains will help air to circulate around the windrows that rest on the stubble and promote drying. Swathers may also condition the hay by crushing the cuticles or surface tissues of the plants. Desiccants are also available to break down or disrupt the cuticle surface. Machinery that sprays a desiccant, swaths, conditions, and forms a windrow can save time and money and cut the time required for haymaking which lowers the chances of bad weather disrupting the haymaking process. Dry the hay to 15-20% moisture. Forage is up to 90% moisture so a great deal of drying must take place. Forage in windrows can be 25% moisture within a few days with the favorable temperature and relative humidity. Windrows should be designed so that the hay dries as quickly, evenly, and completely as possible. Conditioning swathers help the leaves and stems to dry at similar rates. Turning the windrows over facilitates drying. Turning hay in a tumble weed fashion leads to leaf loss and is discouraged. Extremely hot, dry weather can cause the forage leaves to dry too much before the stems dry causing the leaves to become brittle. Brittleness results in breakage and loss of leaf matter which lowers the quality of the hay. Forage managers may turn off irrigation several days before swathing so that plants and the ground are dry as well as using favorable weather for drying. Maintain the green color which is a strong indication that the forage is maintaining its food value. The green color can turn brown when moldy. Avoid molding by following the guidelines for drying, applying a preservative (like propionic acid), and refraining from baling high-moisture forage. The sun can also bleach the cut forage which changes the coloring as well as removes some of the vitamins. Store the hay so that feed quality is maintained and expenditures are minimized. Storage may be done as 1. long hay, 2. chopped hay, 3. baled hay (rectangular, big bales, round bales), or 4. dehydrated hay which are discussed in the 5th objective of this lesson.